Every parent wants their babies to get some sleep because if an infant doesn’t sleep, the adults don’t either. 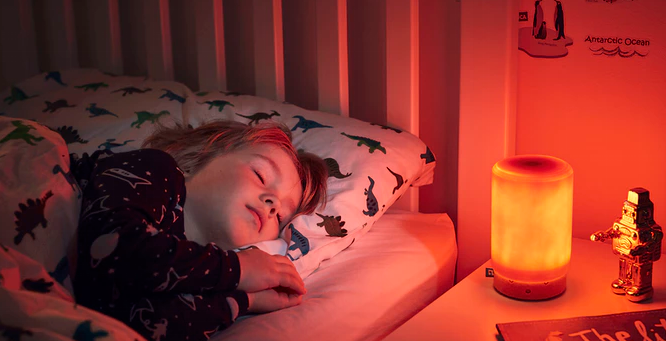 Suzy Snooze is a three-in-one device that uses light and sound to soothe kids to sleep — helping their parents get some sleep in the process — and also helps wake kids up. Suzy evolves with children through their early years — serving as first a baby monitor, then a lullaby nightlight, and then a toddler sleep trainer. It plugs into a wall socket and comes with U.S., U.K. and European adapters. Suzy works out of the box, but also in conjunction with a mobile device app that allows parents to control the device’s functions remotely, including whether to leave the nightlight on or off. Suzy Snooze ships in March at future pricing of $175. But Kickstarter backers have been able to order one for pledges ranging from $99 for early birds to $149. Its makers hope to raise $50,000 by July 21. The three-in-one functionality of the device gives it an edge over other baby sleep aid devices including Lullafi. The one drawback, for now anyway, is that it only works with certain iOS devices (iOS 8 and higher) because Suzy uses Bluetooth LE to pair with the mobile device. Android support, meanwhile, is planned, but whether that is added or not depends on whether stretch funding goals are reached.